It seems I can't go anywhere without someone asking me a dog question. Should we meet, please don't hesitate. Few things give me greater pleasure than helping explain dog behavior. Once you learn to translate canine postures and responses, you'll find that your dog's actions speak louder than words. What then do specific dog behaviors tell us? In this blog, part four of my adoption series, I'll spotlight the most common frustrations people have with newly adopted rescue dogs and puppies. I don't mean to discourage dog rescue! My goal is simply to lead you into it with knowledge, empathy and solutions to common frustrations. Everyone wants a happy ending, most of all the dog or puppy. Feel free to comment on your experiences below. In the coming days I will relate some positive ways to redirect and recondition a dog's behavior without the use of intimidation, prolonged isolation or electrical stimulation. My motto? Don't dominate -- communicate. Meanwhile, here's a page from my training diary and the various rescue dogs I met this week. Monday morning, Oct. 3: Biscuits with Jesse -- dog biscuits that is. A mix-bred spaniel mix from Nicaragua, Jesse was rescued by Joe, age 23 and sent home to his parents with love. Mom and Dad are smitten, but also overwhelmed. Jesse's clearly not accustom to motorized vehicles, interior decorations or carpeting, except as a marvelously absorbent surface to pee on. Tuesday morning, Oct. 4: Meet Rocco -- an 8-week-old husky mix from a Long Island, N.Y. shelter. Within minutes of meeting Rocco he snapped at my hand as I was gently removing a bone. Thirty minutes later and it's determined that his resource guarding is a poor fit for a dog novice household with young children. 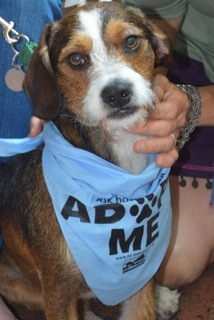 Rocco was returned to the shelter and is awaiting a home better suited to his needs. Tuesday noon, Oct. 4: Meet Rascal, a pure bred rescue who at 5 months is terrorizing the family's collies, Rosie and Petal, ages 9 years and 11 years, respectfully. The family had thought the dogs would work things out, but Rascal's exuberance is bringing out aggression never seen before in the Collies. Wednesday, Oct. 5: Dog Class Day! This fall my roster's filled with as many rescues as purebred dogs. Love knows no breed! During supervised play the rescued dogs seem to gravitate to each other. As with children, there seems to be comfort in shared experiences. Thursday 9 a.m., Oct. 5: At a rescue center in Goldens Bridge, N.Y. I meet up with the two families who've commissioned me to choose a well-tempered, child-safe puppy. Meet the candidates: 5-month-old sisters Dakota and Bridget, lively and playful pincher mixes, and four-month-old Shiloh, a sweet natured Basset Hound mix. One family can't decide, so they've chosen two, Bridget and Shiloh; the other family swoons over Dakota. The puppies are blissfully unaware that they have all landed ultimate homes equipped with kids, a loving teacher, nurturing adults and a yard to boot. Friday, Oct. 6 : A day off to spend with my favorite rescues, my furry family of four: Whoopsie, Balderdash, Hootenanny and Bamboozle! The one thing I adore about my job is that my weeks are never the same. Being a parent to a multitude of species, I feel like I walk at both ends of the leash. Blogging pulls me back to center. And it's true, I've got a soft spot for a good adoption story. These days I'm seeing more and more rescues -- you can find adorable adoptables just about everywhere. On the internet, their descriptions read like singles ads..."Fun-loving buff Bulldog type, burly with a smooth attitude and an obsession with balls." City shelters seem to find their own strays, but suburban shelters are often hard-pressed to find homeless pets, and routinely transport their adoptables from "High-Kill" shelters in rural states. Some people are naively convinced that they can save money rescuing a dog. While its true that most shelters inoculate and neuter their population, most abandoned animals are relinquished for a reason or have developed anxieties while enduring the rehoming process. Housebreaking frustration, tension chewing, manic displacement behavior that results in jumping or mouthing, are many of the complaints I hear as a trainer. More serious reactions include separation anxiety or resource guarding, which are issues that require a strong dose of empathy and patience to rehabilitate. The joys of rescuing a pet are immeasurable and memorable, but it's not a process for everyone. Think you've got what it takes to patiently work with a discarded or forgotten pet? If you do, you may just end up wondering just who rescued whom. My home is a patchwork of forgotten or discarded canines. Of my dogs, Hootenanny and Whoopsie came in as young pups, but the rest were adults when we found them. Each one -- regardless of their circumstances -- had serious issues to overcome. As a puppy Whoopsie had a urinary tract infection that prolonged the housetraining. Hootenanny came up from Arkansas with her litter and by 10-weeks-old had earned herself the nickname: "The Cushion Shredder." Bamboozle's initial response to unknown sights and stimulation? A barking frenzy, reaching octaves only a little 5 pounder can hit. And Balderdash, my big burly German Shepherd Dog who was dropped at our doorstep at 18 months old? He was scared of his own shadow and frightfully anxious when left home alone. So what did I do and what can you do to prepare or help soothe your rescue's relocation anxieties? It may help to consider that many of your new pets' reactions result from confusion or stress, not a vindictive or malignant goal to upset your life. Here are five common frustrations I hear from newly adoptive parents. Can you add to the list with your own story? Please comment below. Housetraining Dogs that eliminate indoors have either not been trained to leave their the home, aka their den, to potty, or are so stressed that they're unable to regulate their internal cycle. As dogs use their urine scent as a permanent marker, many adoptables mark their new homes in order to feel more grounded in an unfamiliar setting. Chewing Dogs chew for pleasure as well as to displace tension. Rescue dogs often chew more than stable pets, and need to be provided with satisfying outlets. Mania -- Many displaced dogs develop assertive behavior patterns , such as jumping and nipping, in an effort to get attention. And dogs, like children, do not seem to care whether the attention is negative or positive. Separation Anxiety -- Many abandoned dogs develop a separation anxiety when paired with newly adoptive parents. Reaction to even short separation can run from mild distress, whining or chewing, to a full blown physiological reaction. These may become destructive to either themselves or their surroundings. They may exhibit other behaviors such as frenetic barking, hyper-active rituals or marking as well. Resource Guarding -- Many dogs develop resource guarding in shelters -- coveting food toys within their reach. Other dogs are abandoned because of this behavior. These dogs have not learned to "share" and will use aggressive displays to defend their possession or resting places. In the next few days I will examine these behaviors as well as others you share and provide tips on how to resolve them. In the meantime if you're considering adoption, you may find the past three articles in this series helpful. Searching for a Dog; Rescue or Breeder? Five Quick Tests when Choosing a Rescue Dog or Puppy, and First Days Home with a New Dog or Puppy.